We made it through Semester 1 and we just completed week one of our new semester. Whew! I wanted to summarize and share our final days in our applied classrooms. This year I was responsible for creating a final performance task for the grade 9 applied and grade 10 applied classes. 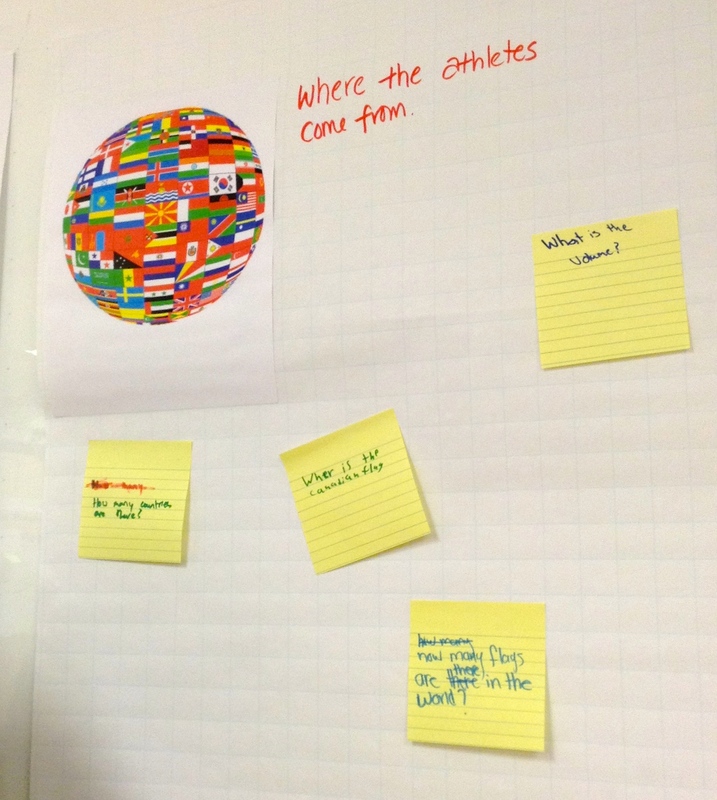 A few weeks ago, a team of teachers came together do discuss what this might look like. 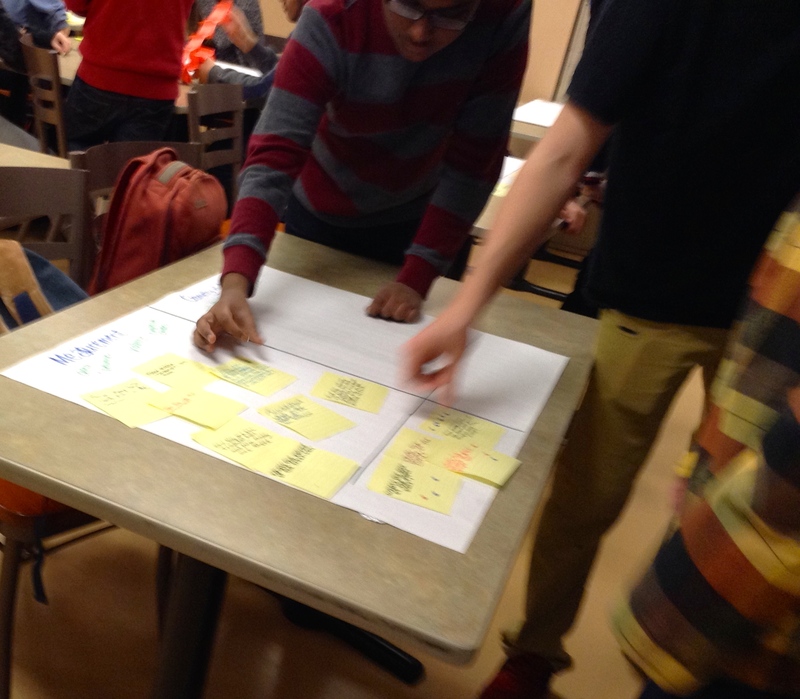 The teachers were creating a task for the applied and college classes (grade 9, 10 and 11). Much of the plans for this task was based on the work done by Alex Overwijk and what I could gather from his blog postings and a few inquiries directly made to him. We didn’t have as many days dedicated to the performance task – and the Grade 11 teachers wanted to include other assessments on those days. On Day One, we posted three themes to create stations that included four pictures/videos each. Videos could be viewed on our Chrome books. 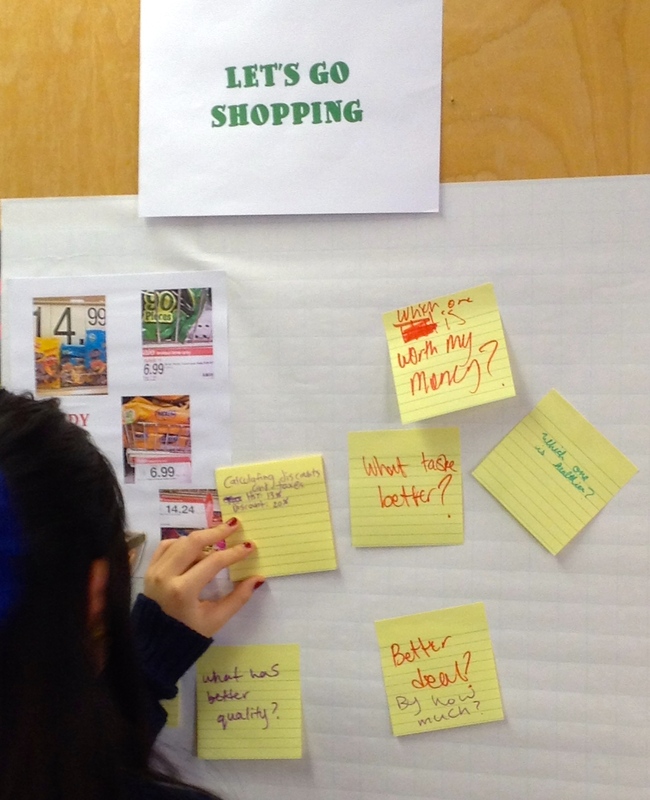 Chart paper was posted on the walls and sticky notes were provided for their questions. The students were paired up and generated questions for each of the pictures/videos for a time period of 10 minutes at each station. They rotated and completed the same time at each station. This prevented from having too many repetitive questions – although we did see some of course. When they had returned to their original station, we had them, as a group, decide and sort each suggested question into one of the topics we learned about in the semester. 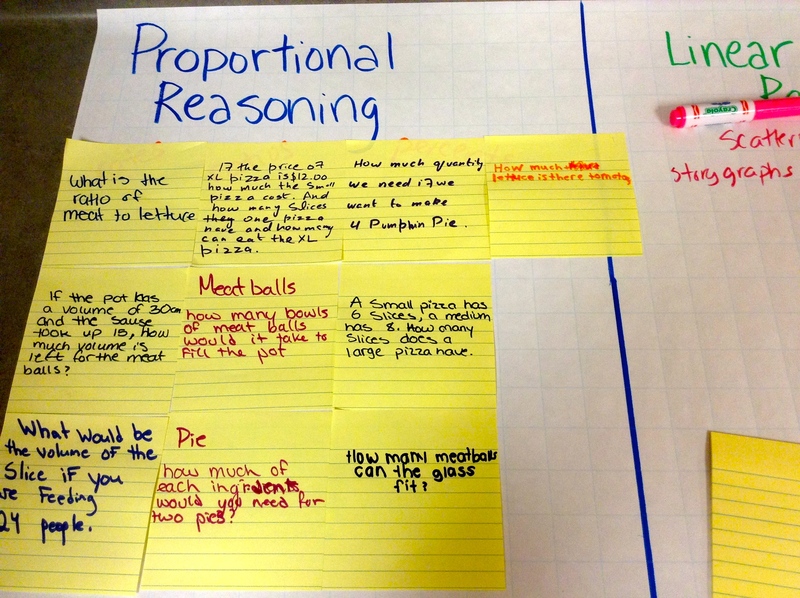 For Grade 9’s we sorted into Proportional Reasoning, Linear Relations, Measurement and Geometry. For Grade 10’s we sorted into Linear Relations, Quadratic Relations, Measurement, Trigonometry and Similar Triangles. This also eliminated the “unrelated” questions that were proposed. 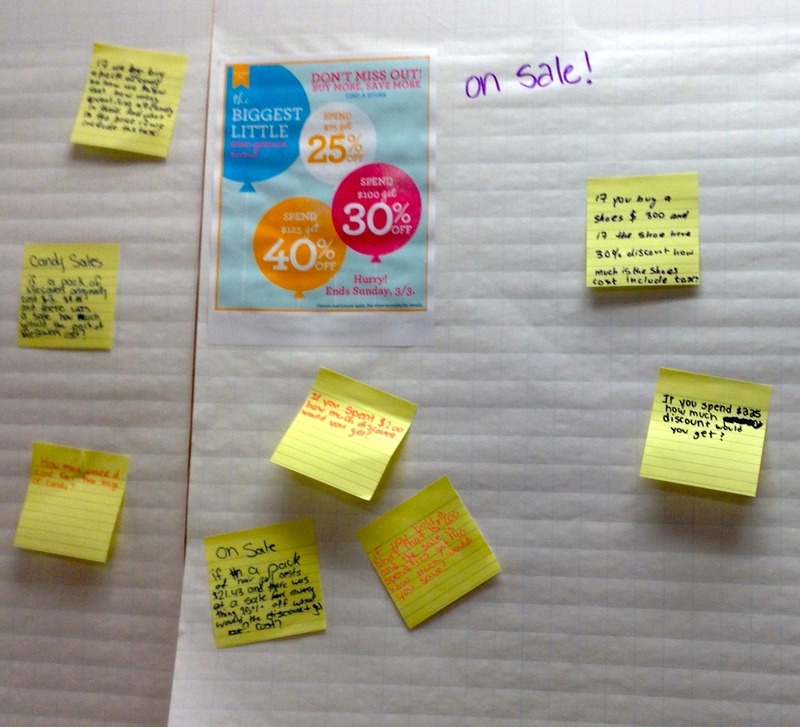 Once this was completed (about 15 minutes), the groups decided on the best five questions placing accompanying reasons why they thought so on smaller sticky notes beside them. 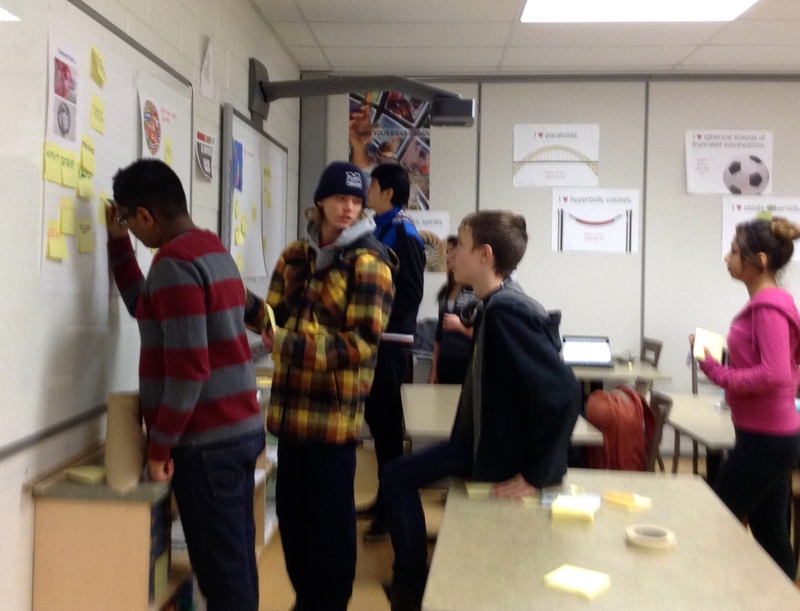 The rotations began again – and students moved to each station to decide, using “dotmocracy” which questions of the best five they preferred to see on their final task on Day 2 and 3. I gave each student 10 dots to vote with. This was the end of Day 1, which worked out really well – but left a fairly large task for the teachers to sort through and decide on questions for the final two days. We honored their choices and if possible – used the questions they voted on. Some of the questions needed clarification or added parts to it – but most were usable in the form they provided. This was encouraging. We separated questions into “easy”, “medium” and “hard”. Then we provided all the necessary data for the students to complete the questions. Day 2 and Day 3 were the same – with students completing the questions which we compiled into a number of tasks to choose from. There were three parts – and they had choice within each part. Overall, this went well – with most students performing well in both my Grade 9 and Grade 10 classes. 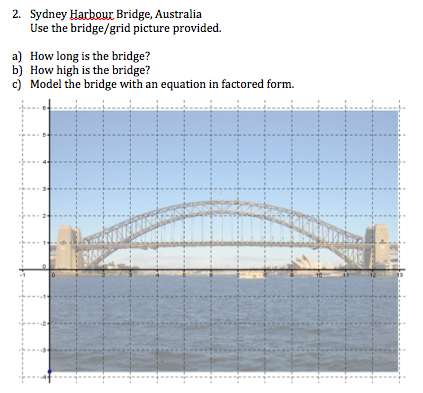 This type of summative task near the end of the semester allowed for students to tell you what they took away as the most important concepts and ideas from each of the topics they studied. The conversations were rich and some of the arguments over the “best” questions were interesting to listen to. 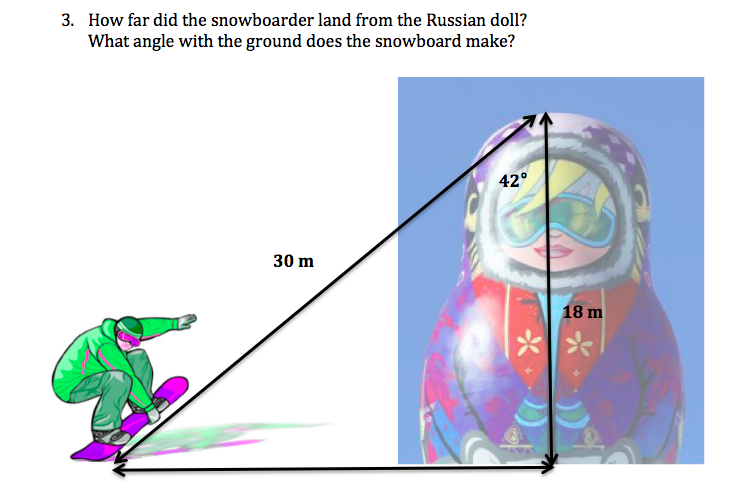 How high did the snowboarder jump? How many stacking dolls fit into this giant stacking doll? 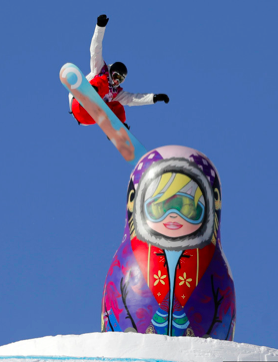 How far away did the snowboarder land away from the doll? Usain Bolt video: Does his speed increase, decrease or stay the same during the whole race? How much did he win by? Who would win – Bolt or a cheetah? How long would it take to cook this burger? What is the volume of the burger? 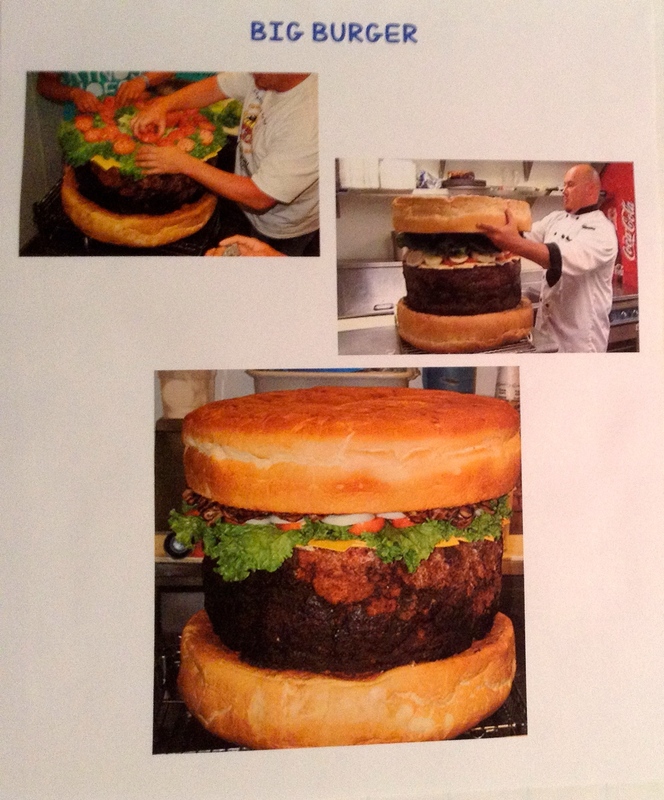 How many regular burgers would you have to eat to equal this giant burger? 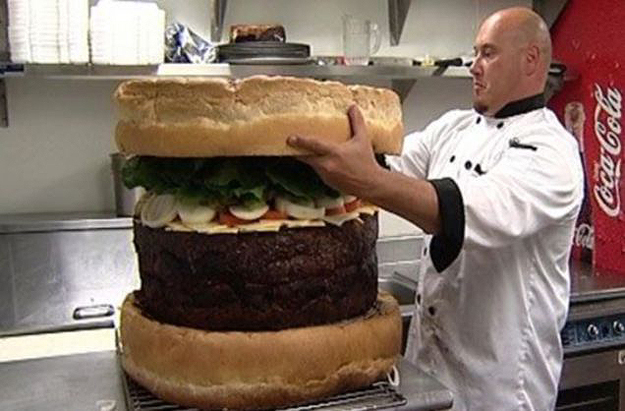 How many people can you feed with this burger? How many tomatoes/onions/pickles would you need for this burger? What should be the cost of the size 12 shoes based on how much they weigh? How much would a size 18 shoe weigh? Why are these ugly running shoes cost $100? 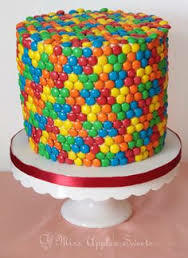 How many M&M’s do you need to cover this cake? How many packages of M&M’s do you need to buy to make this cake? How much cheese did he eat? 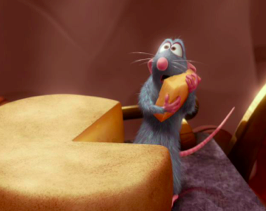 What fraction of the cheese did he take? How did he become so good at cooking? Tangled movie trailer: How long is Rapunzel’s hair? How heavy is her hair? How does she hold up her head? How long does it take her to grow her hair this long? Is it a happy ending? Rocket Boys video (October Sky movie): What speed is the rocket going? What is the maximum height of the rocket? How long is the rocket in the air for? 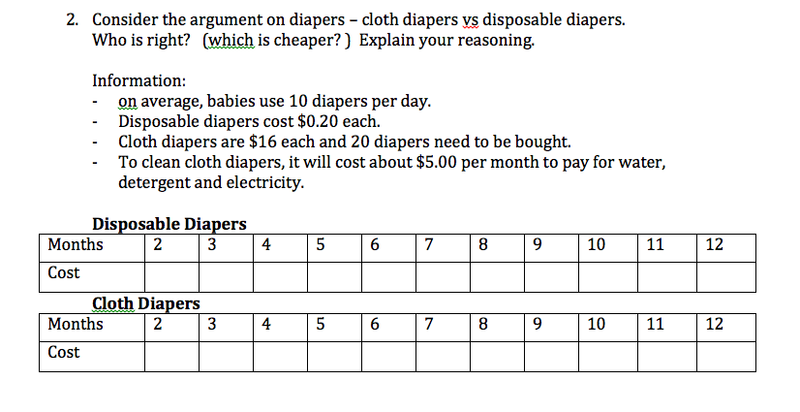 I think they are good questions because we studied shapes and solids and this question is related to what I learned. This is a visual type question – so I think that’s good. I want to work with graphs to find out this answer. This question will provide an answer that is informative. I’m voting for this one because it would be fun to solve. This is a good question because solving for area is just good math. I think circle math is fun. This is a good question because I was curious about it. I chose this question because it is challenging and I’m good at those typees of questions so I would do a good job on the summative. The good: This final performance task allowed students to consider what are good questions and why. They also spent time reflecting on the semester of learning and what they thought were the big ideas and the important mathematics. I really liked how they were able to collaborate with their classmates to come up with questions, and then narrow down to their top five. The variety of questions was astounding to me and with both classes the number of unrelated questions were very low. They were in control and I did not see one student not take part on Day 1. The bad: There wasn’t really any challenges when it came to the students participation and completing their task – but it was a fair amount of work sorting through their questions and then compiling the questions into a format that was easy for them to access and provide solutions for – all in a small window of time, between days. Necessary data for each question was provided. We decided to divide the questions into three parts so they would answer a few questions that were easier, medium and more challenging. 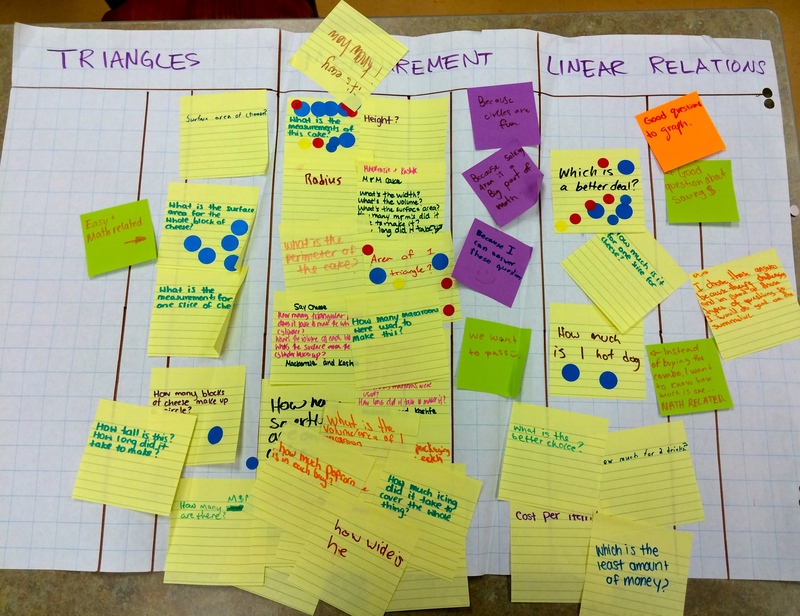 CREDITS: Many of the ideas, pictures and videos come from Alex Overwijk, Mary Bourassa, Dan Meyer’s 101questions, and Yummy Math. Thank you!! Great post with lots of great ideas. I really like the idea of students generating the questions then choosing the ones they like best. Do you do an exam as well as the performance task or just the performance task? I may need to try this out in about four months. In our school board we do not have a grade 9 exam – all students write the EQAO test (15%) and the final performance task (15%). Let me know how it goes. I gave them lots of opportunities to work with pictures, visuals, and videos before the end of semester.